Feast your eyes on the glittering treasures of the Leprechaun King slot online and be prepared for the mound of gold to take your breath away. However, the royal Leprechaun won’t let you share in his spoils so easily, you will have to engage in his mischievous slot game first, if you want a piece of the prize. 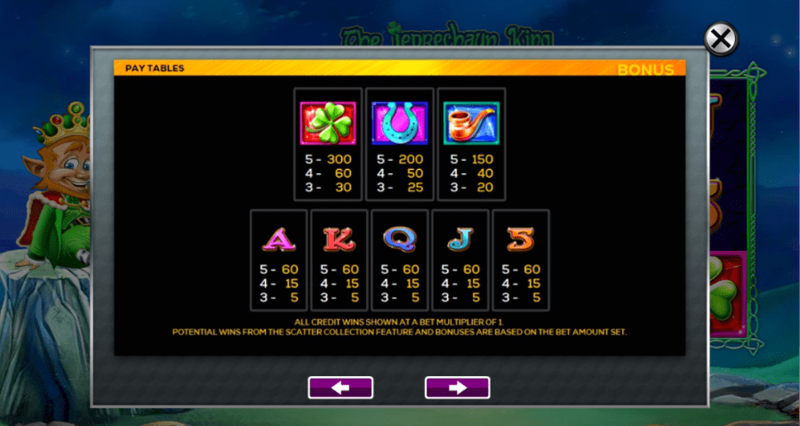 The gaming arena is bustling with Leprechaun themed slot games, but this one royally tops them all with its abundance of features and the generosity of the gleeful Leprechaun King. Don’t delay, bow before the king today and wish to be in the kings favour to be in with the chance to win a regal fortune. 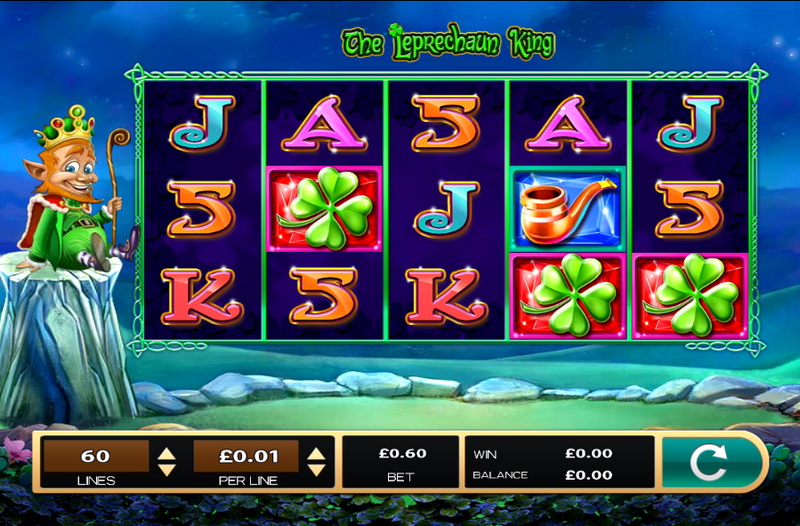 Leprechaun King is a 5 reel slot game with 3 rows and is certainly a sight to behold as it uses all the colours of the rainbow to create the impressive 3D visuals. The Leprechaun King is a well-established slot game rather than being new to the market, and you can see why players love this game and how it has stood the test of time because players keep coming back to this time old favourite slot game. You can check our guide of best UK video slot now! In this Irish themed game, you will encounter a range of beautifully depicted symbols which are in keeping with the theme and the overall game narrative, including a glistening Crown and the famous four-leaf clover. You won’t need to rely solely on the luck of the four leaf clover, however, as there is an abundance of features in this game that will have you kissing the hands of the Leprechaun King in gratitude. There is a Pick Bonus in this slot game, where you will be rewarded handsomely if you land 3 or more Crown symbols on the reels, you will then get the option to choose your prize. You will also benefit from Stacked Wilds in the game which will prove to be exceedingly helpful in your quest for riches, as you will be awarded double for your winning combinations. You’ll find a pot full of gold as well as a whole valley full of fun in Leprechaun King, as the game transports you to the emerald green pastures of Ireland, with graphics so good you’ll feel completely immersed in the Irish folktale. The graphics and 3D design make the gameplay smooth and very enjoyable, you will be smiling from ear to ear every time you play. Best of all, the game is optimised for play on desktop, mobile and tablet devices, meaning you can request and audience with The Leprechaun King at your leisure, whenever and wherever you desire! If you enjoyed The Leprechaun King why not try Book Of Oz?